Amnesty Award nominee Richard Fry's brilliant new play about drink driving, disability and 'Right Said Fred'. 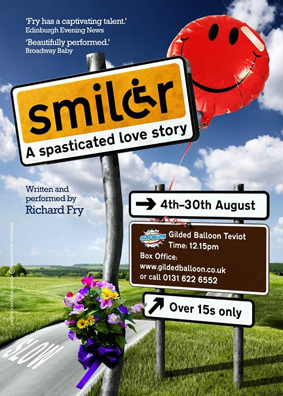 Based on Fry's own friendship with a young man living with a head injury, Smiler is a heartbreaking and uplifting spasticated love story. Fry's second gripping tour-de-verse will have you laughing out loud one minute and holding back tears the next. Inspired by Fry's own friendship with a young man living with a head injury, Smiler examines how we perceive disability: Do we treat those with disabilities differently? How would you cope if you became disabled? What if you were responsible for causing permanent harm to somebody? What if your daughter brought home a boyfriend in a wheelchair? Could you fall in love with someone less able yourself? Smiler also deals with drink-driving, assisted suicide and 1980s German soft-rockers Nena. SMILER is one of Richard Fry's incredible trilogy of 60 minute verse monologues including BULLY & THE BALLAD OF THE UNBEATABLE HEARTS. Jesus (not his real name) is here to talk about his best friend, Smiler. It took a little while for the pair to understand each other due to Smiler's speech defect and Jesus's initial awkwardness around Smiler's disability, but now the two are inseparable. Fry's performance is disarmingly honest and committed - Smiler was inspired by the actor's real life friendship with a young man living with a head injury, and the truth of his feeling is palpable. ...Smiler, is the story of two friends that smashed through that barrier. Using powerful, dark, and frequently humourous prose, writer/performer Richard Fry delivers a story that gets beyond the disability at last, and explores a real friendship between two men. A beautifully constructed piece, we are taken from the awkward first meeting to the ultimate expression of real love (via a costume party dressed as Right Said Fred). FRY HAS A PRECIOUS TALENT!! It reads like a puff from reality TV: a gentle-giant former bin-ban wins fame across the country, with a raw and emotional performance coming straight from his heart. But this is no manufactured sing-along; this is challenging, disturbing, often gut-wrenching theatre. And Richard Fry really has got talent. Smiler, Fry's latest one-man work, is the natural successor to his Fringe debut Bully - a fictional (though surely personal) account of coming out amidst a cycle of deprivation and pain. This year's script tackles a no-less-challenging subject - disability - and, as though that's not enough, drink-driving and assisted suicide find a place on the agenda too. After a lifetime of running dodgy pubs, selling secondhand goods and emptying bins for a living, Richard Fry decided to make an honest career out of writing and acting. Since graduating from Drama Studio London in the summer of 2004, Richard has built up an impressive CV. Film credits include Take 3 Girls, True Identity, London, Natasha, Private Moments, Three Minute Moments, Quality Indigo and Camp Xray - Ghosts of Guantanamo. Theatre shows include his highly successful and internationally acclaimed verse trilogy Bully, Smiler and The Ballad of the Unbeatable Hearts, and Homo Asbo.